Reserve 1 Tbsp. onions. Combine remaining onions with next 5 ingredients. Place 1 won ton wrapper in each of 24 mini muffin pan cups sprayed with cooking spray, extending edges of wrapper over rim of cup. Fill with shrimp mixture. Bake 18 to 20 min. or until edges of wrappers are golden brown and filling is heated through. Top with reserved onions. You can find won ton wrappers in the refrigerated ethnic section of your local grocery store. 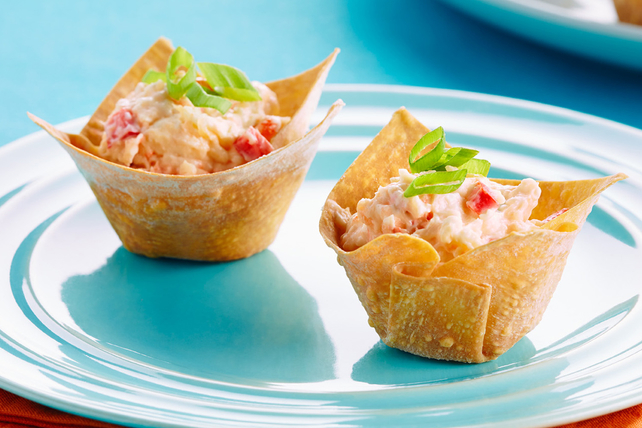 For crispier won ton cups, pre-bake them before adding the filling. Place won tons in muffin cups as directed. Bake in 350ºF oven 5 to 7 min. or until lightly browned. Fill with shrimp mixture; bake 6 to 8 min. or until filling is heated through.